If there is anything I value more in smartphones, it is the battery life. My first actual phone was a candy bar Nokia phone, and it seemingly never ran out of juice. For example, I remember going to Vancouver with the phone without bringing a charger. It lasted the entire week, even though I did not change my usage habits then. Nowadays, smartphones do not necessarily have anything comparable in terms of endurance. My next phone, an Android device, had decent battery life to begin with. However, after two years of use, I ended up replacing it solely due to the lacking battery life. Even now, my current phone is starting to show its age with the battery life dropping like a rock. I used to be able to just charge my phone overnight and last the whole day until I went to sleep the next night. After two years, I now have to charge midday at work every day just to keep my phone alive. As you can see, I think battery life is the most important part of a smartphone, because if it dies and you cannot use it, it is useless. Today, we have the LG X power 2, the second iteration of a phone we have looked at in the past. The first X power emphasized primarily on battery life, but the rest of the phone was not exactly up to par. With the X power 2, I can probably expect superb battery life again. However, is the rest of the phone capable enough to be a compelling option? This question, and more, will be explored when we take a closer look today! 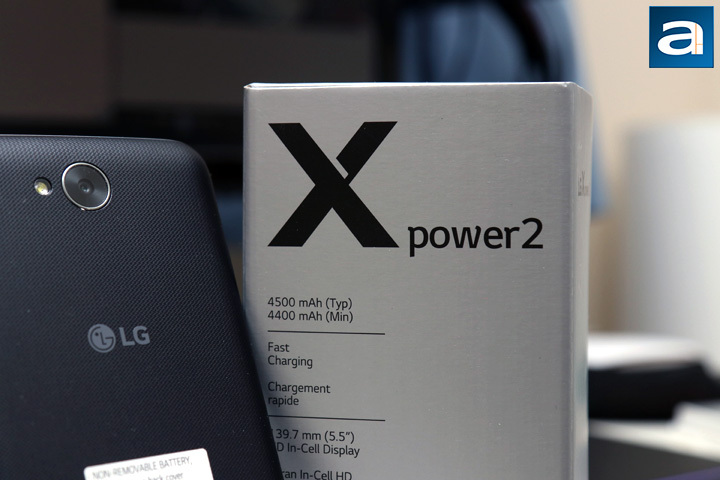 As usual, our unit of the LG X power 2 arrived from Toronto, Ontario. 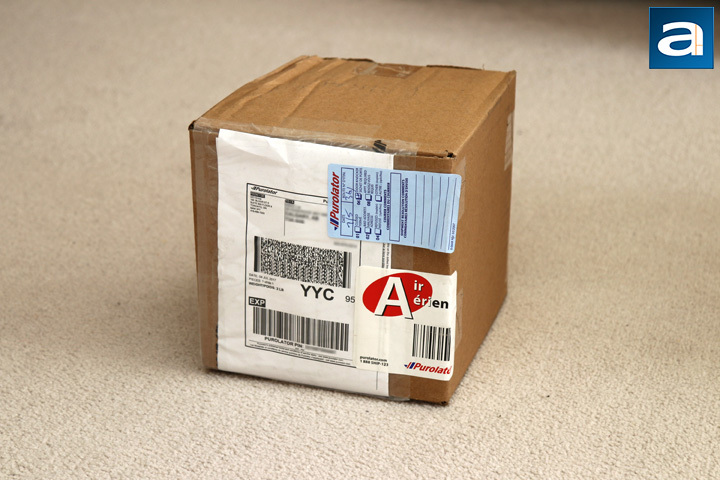 Traveling with Purolator and their Express service, this box arrived in a pretty poor condition. You might not see the extent of the damage from the image above, but this box was quite crumpled in one corner. The edges and the sides around this corner are quite wrinkled, which to me is pretty typical of Purolator. While Editor-in-Chief Jonathan Kwan may hate on DHL, I have never had a great experience with this Canadian delivery service. Thankfully, the people who sent me this box were cautious enough to add some packing paper in order to cushion the smartphone from any blows while in transit. 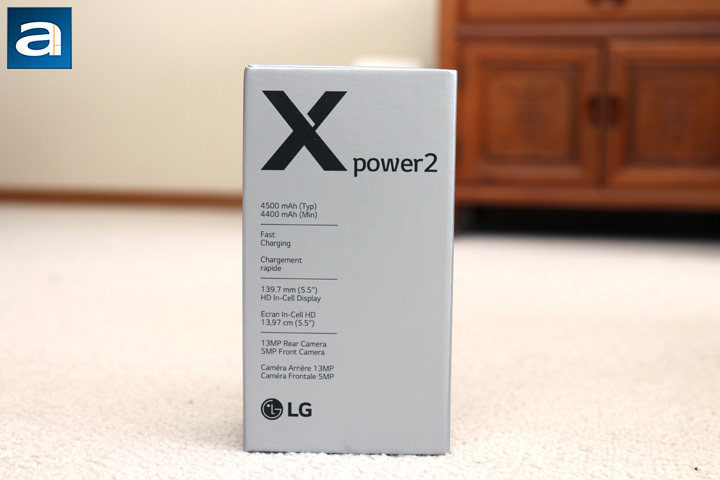 Out of the shipping box, we have the LG X power 2 retail packaging. As for phones go, this is a pretty plain box. The entire container is a silver gray color with black font all over. The front of the box shows the name and highlights some key specifications, with the back panel revealing more. On the side, there is a Qualcomm Snapdragon logo, which is important since this specific Canadian version comes with a Qualcomm processor inside, but other versions of the LG X power 2 use a MediaTek one. Just for your information, this is a Rogers locked unit, but the LG X power 2 is available in Canada on almost all of the major mobile networks. Inside this retail container, we have the phone, in addition to a white Quick Charge 2.0 AC adapter, and a micro USB to USB cable. This cable measures about 120cm in length and can be used for data transfer or charging the X power 2. Camera: 13 MP Rear-Facing camera, 5MP Front-Facing Selfie camera. Just like the original LG X power, the second rendition is once again a pretty boring looking device. The front holds the 5.5" screen with a 5MP front facing camera, a light sensor, and a front facing flash. The top also holds a speaker used for calling. Missing in action is a notification LED. This is something I have become used to, especially if the phone lacks an always on display. The front panel does not have a specified type of glass, which probably means it is not Corning Gorilla Glass. One thing that bothers me is the size of the bezels on this device, especially at the top and bottom. Despite it being the same screen size as my LG G3, the LG X power 2 is both taller and wider. This is probably due to the large battery inside, but I will get to this later. Finally, an LG logo is located near the bottom in a silver metallic finish. 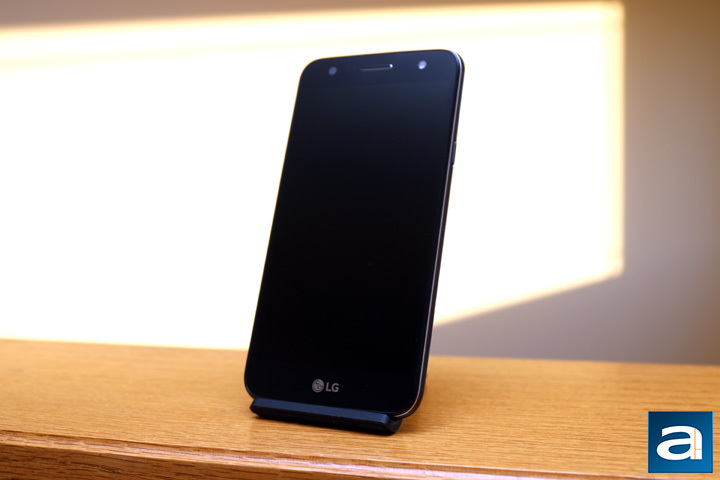 The sides are trimmed with a glossy silver and gray band, but the rest of the phone is dark gray or black. Overall, the design seems average, but also as expected for a device of this caliber. Around the rim of the LG X power 2, we have a few inputs and outputs. The right side has a power button, which once again is annoyingly on the opposite side of the volume down button. This mean sometimes you may accidentally press both buttons when you only intend to press one. On the left side of the phone, a volume rocker can be found. Overall, the buttons offer decent feedback and are raised enough to be easily identified by feel. Near the bottom of the left side is a SIM tray, which pops out with the included SIM tool. 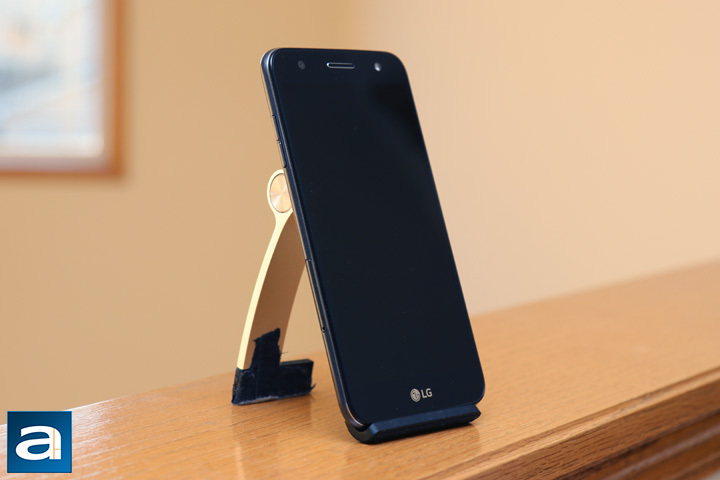 The LG X power 2 takes a Nano SIM. The tray also holds a micro SD card for up to an additional 2 TB storage. Finally, at the bottom, we have two inputs, including a micro USB port and a 3.5 mm audio jack. Thankfully, LG is still keeping their headphone jacks on their phones. Powering on the LG X power 2, Android Nougat 7.0 can be found running on this device. After checking for latest updates, this is the homepage I am now greeted with. As expected, LG has overlaid the standard Android interface with their own user interface. It is relatively lightweight, but there are a few things I think are just a bit too different from stock Android. Personally, I have used the LG UX before, and while it is on my current phone, I still prefer stock Android for its cleaner interface and less bloatware. The biggest change I see immediately is the lack of an app drawer, as all of the installed applications are found on the home screen. Other differences include the Settings menu, drop down menus, and the folder interface. 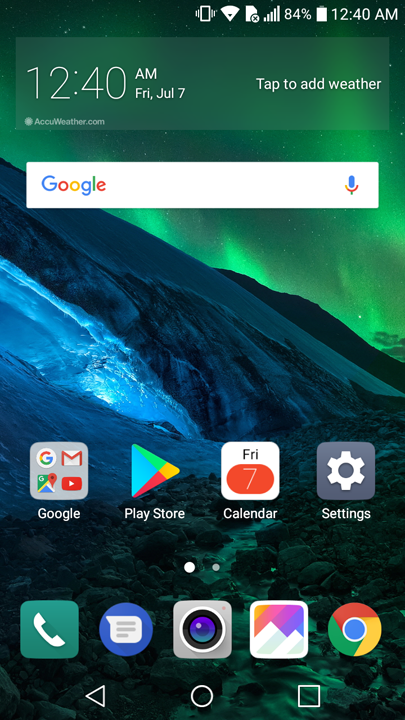 While I have become accustomed to the LG skins on Android, I really cannot forgive the lack of an app drawer, but I guess this is a subjective thing. On the other hand, the amount of bloatware or duplicated apps is not actually too much. I can count about five overlapping apps between the installed LG and Google applications. As for the screen quality, I found it was passable, but not great. With an HD 1280x720 resolution, the pixel density is around 267ppi. By comparison, my LG G3 has a pixel density of 538ppi, and even my Nvidia Shield tablet has a 283ppi. As such, I noticed the lower sharpness of the screen. However, the good thing about this lower resolution is the lower power draw from the screen, as you will see soon enough. The automatic brightness is okay, and generally the colors look bright. The IPS panel also makes for better viewing angles. The blacks are not as deep as some AMOLED displays, but the color reproduction overall is quite acceptable. Internally, the LG X power 2 has what I would call low-end to midrange specifications. With a Qualcomm Snapdragon 425, 1.5GB of RAM, and 16GB of storage, I am not expecting amazing performance. Even still, in daily tasks like web browsing and text messages, the phone gets the job done. During lighter games, like Temple Run 2, I noticed a few dropped frames but they were playable. I think for the target audience of the X power 2 and the price it commands, the performance is on point. In addition, it is still an upgrade in terms of the processor lineup compared to the Snapdragon 210 we found in the original X power. 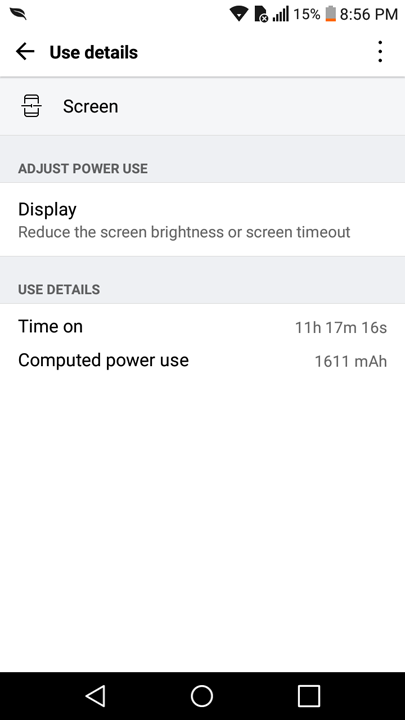 If you thought the battery life on the original LG X power was insane, then you will love what you see with the second iteration. While the original had a 4100mAh battery, this one bumps it up to 4500mAh. The results are pretty impressive too. Once I received the phone, I charged it up to full battery, and started watching live streamed games for an entire day. I also used the camera to take pictures and videos, browsed the internet, and listened to music on this device. At the end of the day, the results speak for themselves, as the X power 2 gave me over eleven hours of screen on time spanning over two days of use. Furthermore, with such a massive battery, the LG X power 2 has Quick Charge 2.0 to fill up the battery quickly. After reaching 15%, I immediately plugged my phone in, and it took about two hours and fifteen minutes to fully charge my device. Even though this may seem pretty long, considering the size of the battery, this is quite impressive. Overall, this aspect is probably the strongest part of the phone, as it really can last two days before needing a recharge. Turning to the back of the device, we have a few interesting things to speak about. The back of the device features a similar gritty like design we saw on the original X power, making this phone pretty easy to grip to. While it may not necessarily look good, it functionally performs fine. It should be noted this back is not actually removable, so those wanting to replace the battery will not be able to do so. From the bottom we have a speaker, which is pretty underwhelming. 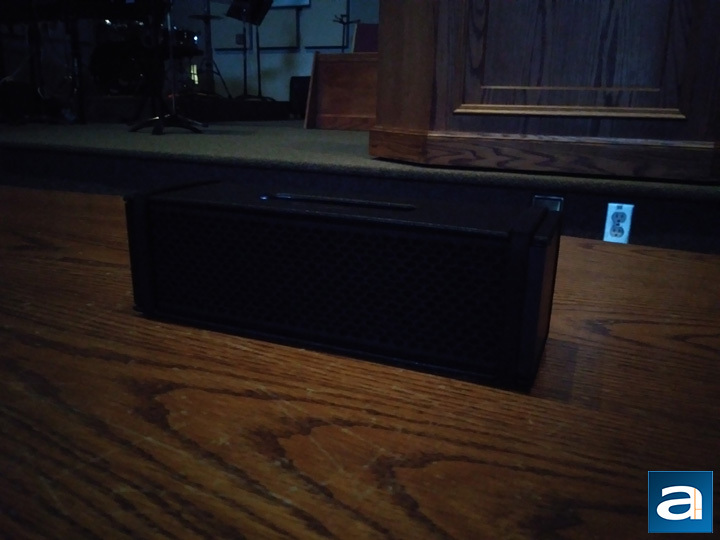 While it can get loud, it also distorts at too loud of a volume, and the backfiring nature of it means you will have to cup the device to hear the speaker more. At the top we have the 13MP camera with an LED flash beside it. Otherwise, an LG logo can be found at the back as well. Let us now dig into the camera and its capabilities. One big part of smartphones nowadays is the camera quality. As the saying goes, the best camera is the one you have ready, and since most people have their smartphone with them all the time, this becomes your most used camera. As such, I tested the LG X power 2 in various conditions, looking at different features and things. Majority of the shots were taken in automatic mode, which is the only mode available. HDR mode was on automatic the entire time, but I will tell you when HDR is actually active for the photo. All of the photos have only been edited for resizing, and otherwise have been left as is. As for the first photo above, this is a standard shot taken indoors with natural lighting. You may notice this shot is very similar to the LG G5's first shot I examined. However, unlike the LG G5, the photo quality seen on the X power 2 is underwhelming with many issues around the image. First of all, the color reproduction is quite terrible. The image was taken in daylight, yet it looks dark. Dark areas are washed out, and there is a green tint seen near the back walls. The image is soft and blurry, offering zero sharpness. Shadows contain a lot of noise and overall the image is pretty bad. Of course like all smartphone cameras, when you zoom into these photos on a pixel by pixel basis, you will start seeing the imperfections, but this is quite disappointing. 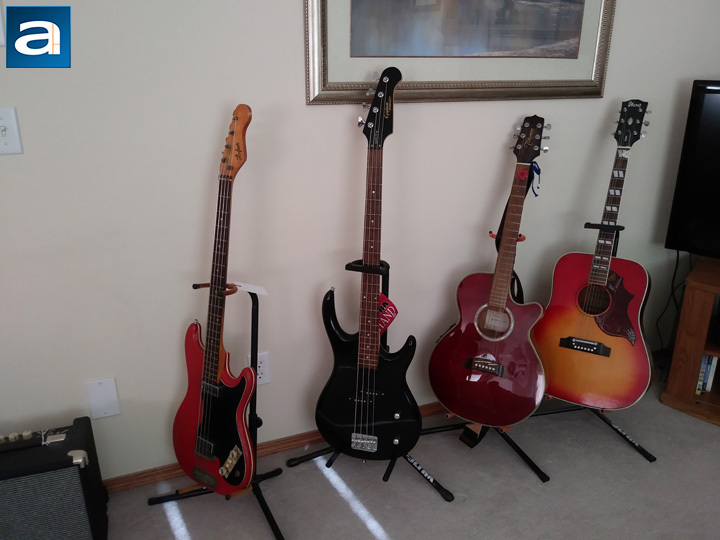 In this shot, we have a better lighting situation, with direct sunlight on these objects. These miniature block statues were gifts from a friend and my sister. 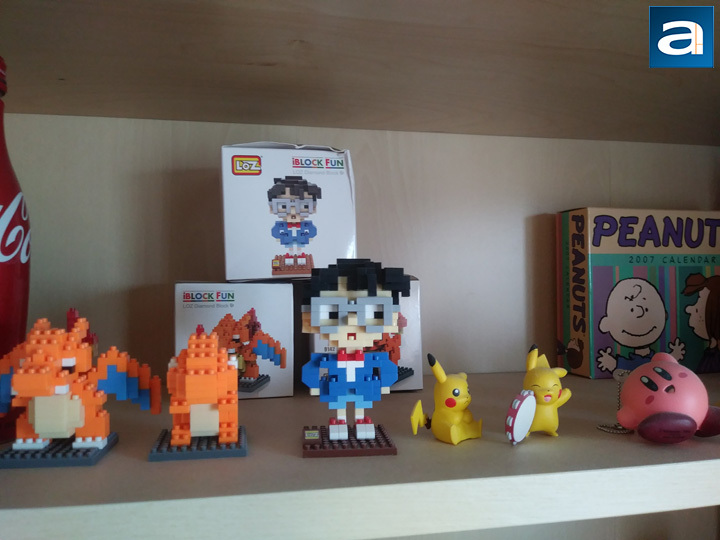 As you may be able to guess, the two furthest to the left are Pokémon, while the middle one is Edogawa Conan from the kid’s anime, Case Closed. Despite the better lighting, the washed out color and cooler tint can be seen over the entire photo. The bamboo color shelf is quite off color, and the orange on Charizard and Charmander look faded compared to the actual color. The good thing is that the X power 2 was able to maintain focus on these closer shots. While it is still a usable shot, softness can be seen on each of the mini brick nubs and throughout the finer details. The color reproduction is probably still the biggest issue I have with this shot, as it is inaccurate. At a sunset-like setting outdoors, the LG X power 2 is capable of producing usable shots with acceptable color accuracy. The sun on the left side does create a slightly underexposed shot, but I think this is quite normal for a phone camera of this caliber. Details are still lost, especially in the background, but you can still make out things like trees and houses. 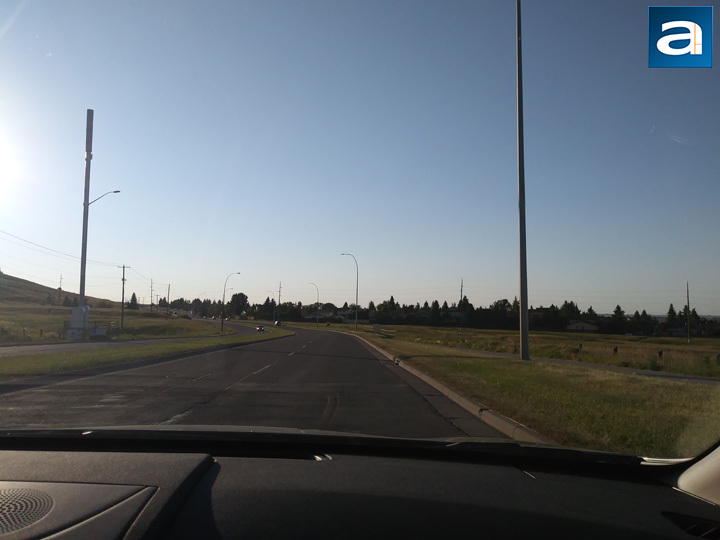 Oncoming traffic and grassy areas blend into the road, again due to the difference in brightness in the sky compared to the ground. Also, the blue is quite a bit darker in the sky than it actually was in real life. In lower light situations, the LG X power 2 truly struggles. This is not too surprising, as all phone cameras suffer in darker environments, but the amount of blur, noise, and overall graininess is really hard to bear here. With this shot of a V-MODA speaker, you can see some parts are in focus, but overall it is still blurry. A heavy amount of vignetting around the edges can be seen clearly. The subject of the shot itself loses quite a bit of the finer details, such as the grille holes. I should note this was taken with HDR automatically enabled, translating into some better colors of the wooden surface and the pulpit behind it. However, anything further in the background is hidden either in shadow, noise, or has no detail. This photo may be improved by using the flash here, but I generally find flash causes unnatural lighting and this leads to other side effects. It really would not be an APH Networks phone report if we do not take a selfie with the front facing camera. Despite all the issues I have with the main camera, the selfie shooter is not bad. Its color reproduction in good lighting is acceptable, and the camera is able to capture enough detail. 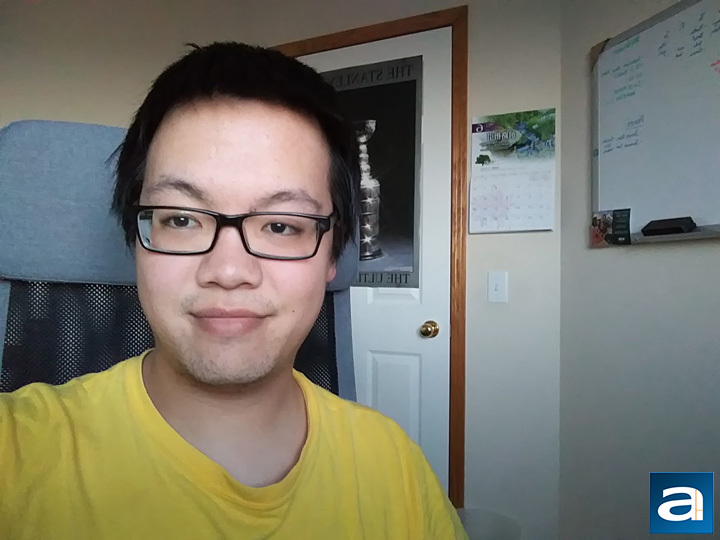 While I definitely needed a haircut in this shot, I think the secondary camera on the LG X power 2 captures a better shot than the back camera. One thing some users may not like as much is the fact this camera is not as wide of an angle compared to the original LG X power. Wider angles, especially on the front facing shooter, is preferred, as it makes getting more people into a group selfie much easier. However, I think the camera here is good. If it were not obvious by the specifications alone, it was pretty easy to answer the fact this phone definitely has amazing battery life. However, how did it fare as a midrange phone otherwise? Overall, the LG X power 2 is a pretty good phone for its price, but there were compromises made to keep the battery life so great. Things like the lower resolution screen and a battery-sipping processor were definitely noticeable, but I never found these issues to be a problem in daily use. More intensive applications will require a better processor, as there were frames dropped in some games, but it is expected in this class of phones. Build quality and aesthetics are mediocre with the LG X power 2, as there is a lot of plastic on this phone. It would be a bit silly to expect glass and metal at this price, but I think LG could have done better than this uninspired design. When it comes to the user experience, I know there will be people who deny this phone purely because of the lack of stock Android, but the LG overlay on top of Nougat is not overwhelming by any means. There is not a whole lot of duplicated apps, and LG has actually included more of the Google apps for core functionality. Otherwise, the rest of the phone is pretty good in day-to-day performance. The biggest issue I still have with the original and this X power 2 is the camera quality. The back-facing camera is particularly lacking, with flaws like poor color reproduction, noise, and overall softness plaguing this phone. The front-facing camera is not as bad, but still could be better. At a price of as low as $250 outright in Canada from practically every carrier, this device fits the bill as a midrange phone. If battery life is your main concern in a smartphone, then the LG X power 2 should be considered. 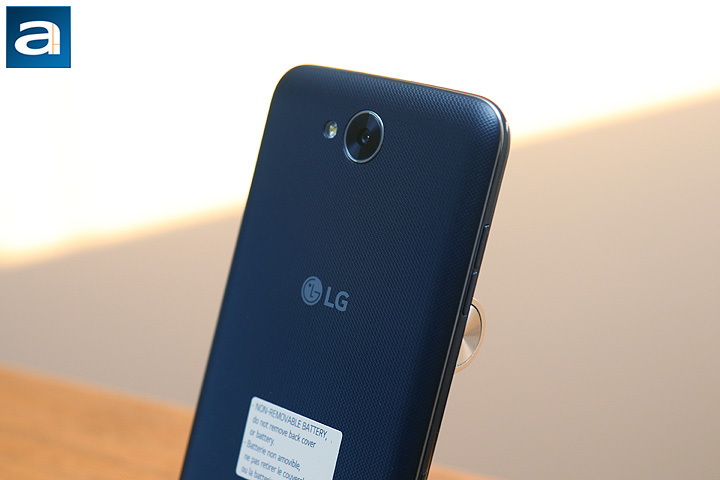 Do you have any comments or questions about the LG X power 2? Drop by our Forums. Registration is free, and it only takes a minute!